The version 5.5 beta 13 (Java Web Start, Windows installer, macOS installer and Linux 64 installer) comes with updated translations and a more complete management of content creators. 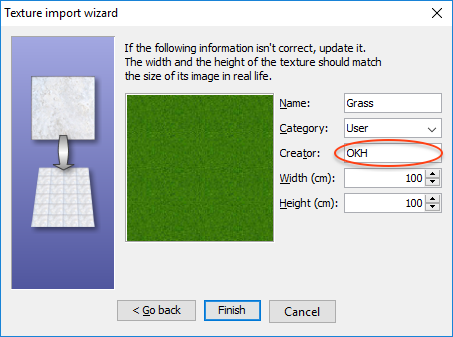 It's now possible to enter the creator of imported furniture and texture images in the wizards, and the Creator column displays the creator of a 3D model + the creators of textures applied to the object. /j3d.version=1.6 will force the installation of Java 3D 1.6. As Java 3D 1.6 seemed to cause some problems for some users under Windows 7 and older versions, I also modified the behavior of the installer in such a way that Java 3D 1.5.2 will be installed by default under Windows XP, Vista and 7. To use these options, simply execute the installer in a cmd window followed by the options of your choice separated by spaces. I should release Sweet Home 3D 5.5 in the coming days. Just wait for some feedback from users to be sure that the new options and Java 8u144 work correctly for them. Good, again no issues discovered so far. Congratulations. 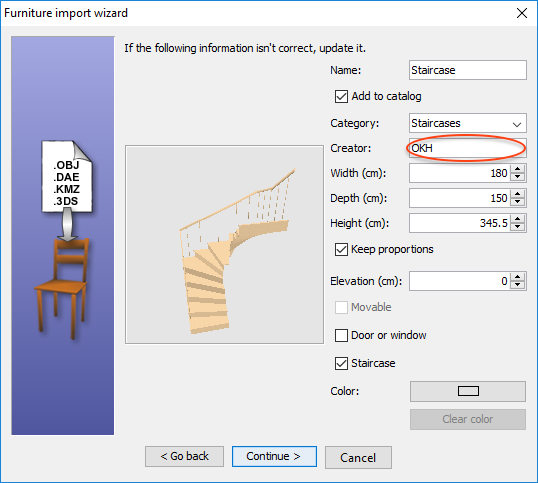 Have a feeling this is a silly question, but exactly where in the import wizards can you add creator? Insecure property: (com.eteks.sweethome3d.applicationId, SweetHome3D#JavaWebStart) specified in unsigned jnlp file will not be set. Insecure property: (com.eteks.sweethome3d.deploymentInformation, Java Web Start) specified in unsigned jnlp file will not be set. I wouldn't bother about the report about the insecure properties in the Beta version. I know the Beta versions in Java Web Start are configured less securely than in releases. There seems to be some kind of a regression in beta 13. Using Mint 18 (=Ubuntu) I double-click the java3d-1.5.2. option. I see the window where I choose Run or Run-In-Terminal, but nothing happens. Checking beta 10, all is normal. @Hans seems to be a Mint problem or a individual one.